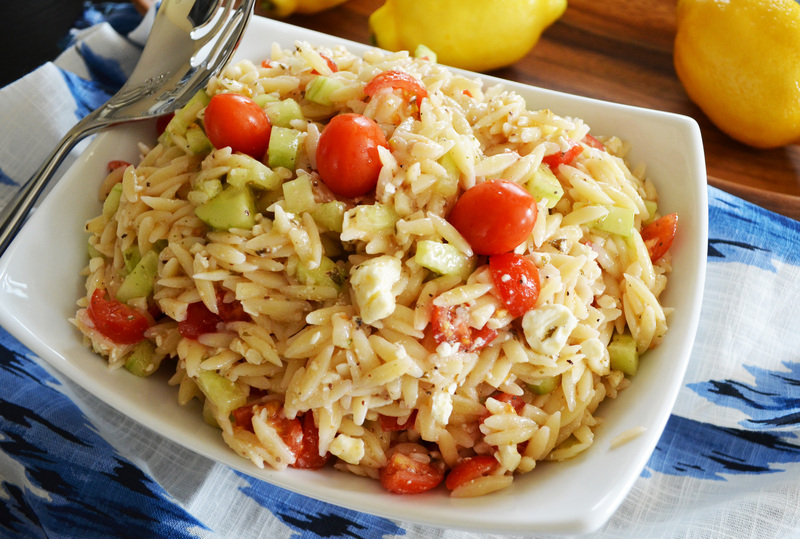 This Fresh Summer Orzo Salad is not only for the summer time, it is also great to pack for lunches and a refreshing side dish to enjoy all year long. Summer time, when we magically forget about what winter frost feels like. Sort of lol, we all secretly fear that the next winter will be here before we know it, but for now we wear our denial hats. Denying that winter will one day be back in full force is one way we get through. Otherwise, that depression that comes with dreaded cold gloomy months would never end. This summer orzo salad is one of those dishes that can make us forget all about hot chocolate and soup, for now. Its a light, fresh, simple and flavorful side to any summer meal. The dressing for this orzo salad is my favorite compared to all the others I’ve tried in the past. Organic Red Wine & Olive Oil Vinaigrette, another one of my Trader Joe’s favorite find. This dressing plus freshly squeezed lemon juice flavors the pasta salad to perfection. I suggest making this dish ahead of time, pouring extra dressing and letting it soak into the pasta over night. Add cucumber, tomato and feta cheese for a wonderful texture and taste. You can always add black olives, I’m just not a big fan so I do not. I seasoned the dish with Urban Accents Herb & Sea Salt Corn Cob Seasoning from Crate and Barrel which was wonderful, but you can also use a lemon pepper seasoning.